Thank you for choosing JustUs Chiropractic Marketing to grow your practice. By putting your trust in JustUs makes us responsible to share ideas and suggestions to assure your marketing dollars produce the highest return on investment. I realize results need to justify investment when it comes to marketing. 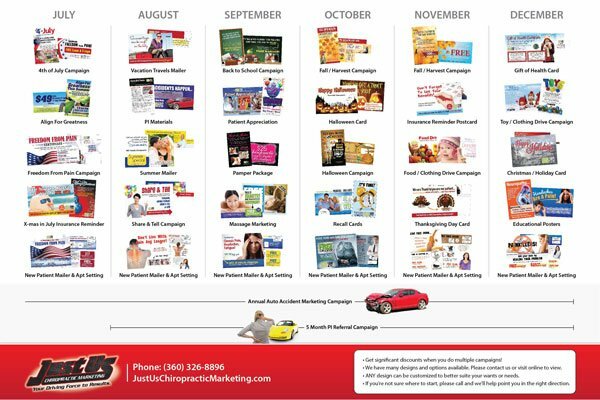 Therefore, I have included an annual calendar of marketing highlighting what the largest and most profitable practices in the nation do. This will give you ideas when planning for 2017 and assures your marketing is balanced and profitable. Having specialized in Chiropractic Marketing since 2004 I am dialed into what’s working, trends and what’s upcoming. 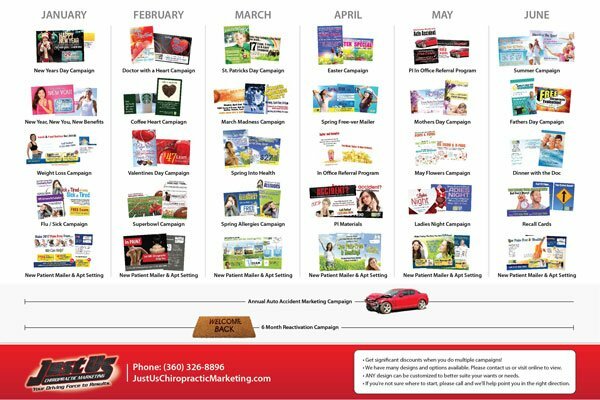 For 2017 you should consider specific programs and campaigns (outlined in calendar) proving to produce HUGE returns for practices all around the nation. For instance, combining mailing with appointment setting is an amazing combination for reactivation, new patients, personal injury, PI referrals, and even recall. Feel free to utilize this calendar anyway that works for you. If you have any questions feel free to call me directly at 360-334-6226 or email [email protected]. P.S. – I’d be happy to set aside some time to help create a 2017 marketing plan. Call me to setup a time. P.S.S. – Be sure to check out our website and view the Worlds Largest Online Print Store to find proven materials for any of your seasonal or marketing needs. Don’t forget to use code “30 OFF“ to get 30% off at check out!